India is in the limelight nowadays in international media outlets for the Statue of Unity. The Brainchild of the prime minister Mr. Narendra Modi is now completed and inaugurated by himself. 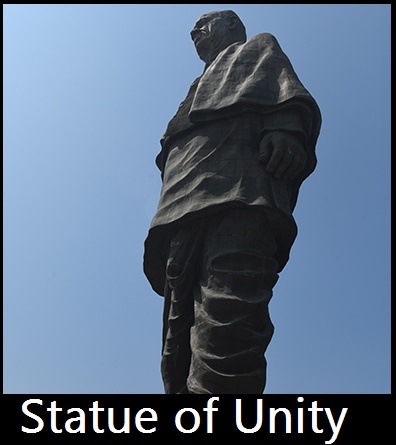 The Statue of Unity is nothing but a statue of Iron Man of India, Mr. Sardar Vallabhbhai Patel. What is the main attraction here? Well, it is the longest statue in the world that surpasses the heights of the Spring Temple Buddha in China and Statue of Liberty in the United States of America. The Sardar Vallabhbhai Patel was the Indian Freedom Fighter and the politician, who is known for their strong actions against the Royal families in India. The Sardar Patel tool the strong measures to unite all the royal families and merge them in the Indian Subcontinent. That’s why, the Sardar Patel is known as the Iron Man of India, who took extreme steps with calm to maintain the unity of India after the Independence from Britishers and the Partition of Pakistan. What is the Statue of Unity? It is the Statue of Mr. Sardar Vallabh bhai Patel, who was aprominent freedom fighter and the politician in India. The Vallabhbhai Patel united all the royal families in India after the partition and merged the princely states to form current India. To Honor the courage and the decisions of the Sardar Patel, the Government of India decided to erect his statue which is known as the Statue of Unity. The Statue of Unity is located in the River-Island facing the Narmada Dam. The nearest big city from this Monument is the Vadodara, which is 100Kms away from the Unity Statue. It is not just a statue of Indian politician, but the memorial to honor their contribution towards building the country. Who Built the Statue of Unity? 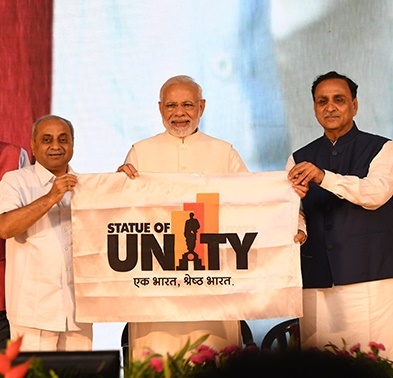 The idea of the Statue of Unity is of the Prime Minister Narendra Modi, who wished to dedicate the unique Statue as a tribute to the contributions of Sardar Patel. We all know the mastermind behind the original Idea, but do you know who built the monument? Who designed the Statue and who did the constructions work? Let’s read about it.. The Statue was designed by Padma Shri Ram V. Sutar, who is a famous Indian Sculptor. Mr. Ram Sutar designed tons of iconic status and the sculptures in India and received the both highest citizenship awards, Padma Shri and Padma vibushans respectively. He handled the design and the culture part of the statue. How Much Does Statue of Unity Cost? 1.The Statue of Unity in Gujarat is currently the Tallest Statue in the world with a height of 182 Meters. 2. The Construction of the Statue and the Exhibition Hall was completed within the Record time of 33 Months. The gallery on the Statue can accommodate more than 200 visitors at a time. 200Km of the surrounding area. earthquake of 6.5 Richter Scale and also the wind speed of 60m/sec. Steel Structure and the outer layer of bronze plating. How to Book Statue of Unity Tickets? Observation Deck view, Valley of Flower, Memorial, Museum & Audio Visual Gallery, SOU site, and Sardar Sarovar dam for ₹350/-. This ticket includes the Bus Ticket to the Statue Site. Second ticket type provides access to everything except the observation deck of the Statue. A single ticket for an adult is priced at ₹120/- and that includes the bus ride to the venue. Both of ticket shave affordable rates and provide access to the entire site. We all read the news and nowadays there are lots of news coverage given on a topic called “Aadhar card”. 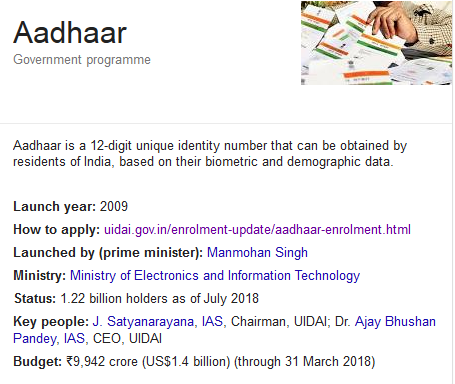 If you don’t know what aadhaar card is then don’t worry because aadhar card is nothing but a 12 digit unique identification number issued to every resident of India according to their demographic and biometric information. However many people know this basic information but very few of them know what was the purpose of launching this scheme. UIDAI was established on 29 January 2009 under UPA government and this project was led by Nandan Nilekani who was the former CEO of Infosys. Mr. Nandan Nilekani is the person who decided the logo and the brand name called “AADHAAR” and this project got its approval in 2010 from then prime minister Dr Manmohan Singh and since then it’s mandatory for UIDAI to issue aadhaar card to every person who is a resident of India. As I mentioned earlier Aadhaar card serves as identity proof and nowadays many things require you to submit the Aadhaar card number like if you want to open your bank account then it’s necessary that you provide the aadhaar details of yours to the bank. However, if you don’t have aadhaar card then please follow these steps in order to get one. First of all, visit the enrollment center located near your area. Fill up the necessary documents along with your Biometrics and photographs. After submitting the documents you will be given the acknowledgment slip. And keep this acknowledgment slip till you get your aadhaar card at your given address. So by following these steps, you can successfully apply for your aadhaar. However, when you’re expecting your aadhaar card to get deliver to your home please be patient because these are delivered via India post which normally delivers things pretty much late. The one thing which everyone wants to know after applying for the aadhaar card is its status. Since many people enroll at the same for the aadhaar card it normally takes more than 90 days to deliver the aadhaar card at the home address of respective aadhaar holder. However, if you want to know where your aadhaar is now then you can check that by following these steps. First of all, go to the official site of UIDAI. Put the enrollment ID, date and time of the enrollment, security code and click on check status. Now if the status is saying that your aadhar is generated then it means you can download your e-Aadhaar card. Now in case your aadhaar is generated but you haven’t received it yet then you can download your e-aadhaar card which has got the same importance as a physical form of it and you can use it for various purposes. So follow these simple steps to get your e-aadhaar card download. And then click on “Download aadhaar” button. 1- Update the needed information on your aadhar card by visiting the enrollment center in your area. 2- You can also update your aadhaar information online by visiting UIDAI site. 3- You can send the required documents through the post to the UIDAI. You can submit only those documents which are self attested otherwise your application will get rejected. You will have to upload the scanned copies of above mentioned document when you’re changing your address online so make sure that every document is in good condition. What to Do When You Don’t Receive your Aadhaar Card ? What to Do to Lock/Unlock Aadhaar Biometrics? Many people nowadays believing that their details which are connected to their aadhaar cards like mobile number, bank accounts etc are in vulnerable condition but if you’re feeling in that way then you can always lock/unlock your aadhaar biometrics. Now click on “enable biometric locking” if you want to lock your biometric data. If you want to unlock then follow the same method vice versa and click on ‘disable biometric locking” option. First of all, install the app and signed into it by entering aadhaar number and verifying your mobile number through OTP. Then, on top right side click on Biometric Lock option and enter your desired password to lock your biometric information. You can unlock it by putting the same password you used before. There are many people who daily search for the queries like this one just because they have lost their enrollment receipt or aadhaar card and if you’ve also lost your aadhaar card then don’t worry because on UIDAI site you can easily claim a duplicate copy of your aadhar or enrollment receipt. So follow these steps to get the duplicate copy of your lost aadhar card. 2-Now choose “Aadhaar Number” or “Enrollment Number” whichever you want a copy of and put basic details like name, surname, email and registered mobile number. 3-Now enter the OTP which is sent to your mobile number and click on “verify”. 4-Then you will a receive your aadhaar or enrollment number via a text message on your registered mobile number. 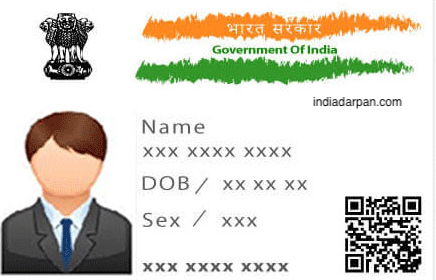 5- Now visit this URL ( https://eaadhaar.uidai.gov.in/ ) and enter your aadhaar number and other details like name, surname, mobile number etc. 6- Now your authentication is verified by OTP so enter the registered mobile number to get the OTP code. 7- Put the OTP number sent on your number and click on “validate and generate’”. And this is how you will be successfully able to get the duplicate copy of your aadhaar or enrollment ID generated. So this is the basic information which I’ve covered up in this article relating to the aadhar card and related stuff and I hope you liked this article. However, if you still got some doubts or questions regarding it then you can comment down below and I’ll try to answer them. The Sainik schools in India are the institutions made for the education and recruitment of the military cadres. The students in the Sainik schools not always become successful military personnel, but also the successful Businessmen, engineers, doctors,and others. These Schools are designed for the students who want the military education and want to adapt to the same culture. The Rashtriya Indian Military College inspires the Sainik Schools in the Indian states. The main aim of the Sainik Schools in India is known as the elite educational institutes for providing the top-notch education and groom the potential military personnel. There are 27 Sainik schools in India, where thousands of students are grooming for becoming the part of Indian Military, Navy and the Air Force. If you are interested in finding the Top Sainik Schools in India, you should know that all are the best ones. None differs in every aspect of becoming the best school in India. In this post, we will share the list of Sainik schools in India, which you can check and decide if you want your child to enter or not. There are total 27 in India. The Military sets up these schools in the Indian states and already established the 27 schools. Each state hosts one military school. 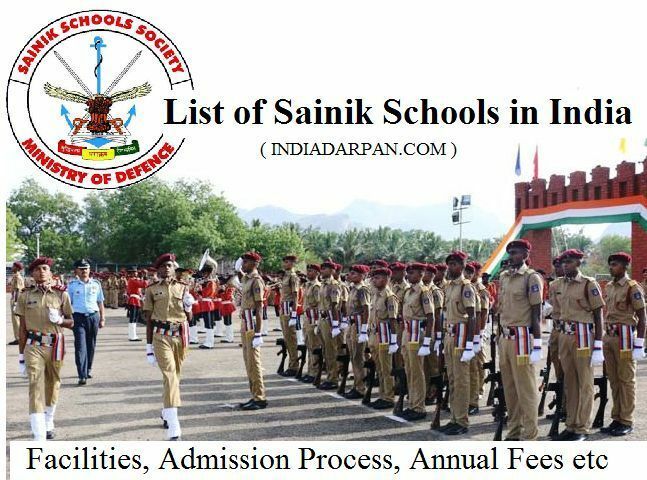 Here is the complete list of Sainik Schools rank wise which you must check right now. The Sainik School in Satara city of Maharashtra state is one of the top-tier schools in India. The Satara Military school was founded in 1961 by the Defense Minister Mr. VK Menon. The main aim of this is to physically and mentally prepare the students to enter into the National Defense Academy to become the part of Indian Defense Forces. The Sainik School in Amravathinagar is one of its kind military school in India. This was founded in 1962 with first class infrastructure and teaching facilities. Just like any other military school, the main aim is to groom the students to enter the NDA. The Sainik school based in the hills of Ghorakhal is also one of the best Sainik schools in India. The school was founded in the year 1966 and is based in the Hills of Uttaranchal state of India. This school operates with the sole aim of training young students to join the National Defense Academy. The School based in the Balachadi of Gujarat state is one of the top Sainik schools in India. With the facilities like 300+ acres of campus area, state-of-the-art classrooms,and the big library, the students get the best knowledge and get ready for joining the NDA to become the Part of Defense Forces. The Sainik School in the Imphal of Manipur state is one of the first military schools in the northeastern states. The School was founded in the year 1971 by the Indian Defense forces to groom the students for rigorous training years at the NDA. If you ask me for one of the oldest Sainik schools, then I will nominate the Bhubaneshwar Sainik school. The 1962 Sainik school had the state-of-the-art infrastructure and training center back in the days. Nowadays, it is considered one of the best schools all over India. The Rewa in the Madhya Pradesh state of India hosts one of the first military schools. The Rewa Sainik school was started in the year 1962 and still produces strong candidates for the National Defense Academy. Some of the students of this school are now the top tier military officials. The Bijapur in Karnataka State hosts states only Military school as of now. Started in 1963, the Bijapur Sainik school focuses on highly talented candidates for the job in Indian Military, Air Force and the Navy. The School focuses on high-quality education with the sports and other extracurricular activities. In the year 1961, the Government and the Defense Forces founded the Kapurthala Sainik School for grooming the strong Punjabi Youngsters. This military school does not only focus on physically grooming the candidates, but they educate them with the provided education system for a better future. The only military school in the State of Rajasthan is known as one of the first five Sainik schools in India. The Chittorgarh Sainik school was founded in 1961 by the Government of India. This is the second Military school in the State of Andhra Pradesh. The Andhra Pradesh hosts three Sainik schools in India,and all are known for grooming the best candidates for the National Defense Academy. Most of the graduates from this school are made to the top level in the Defense Forces. The Kalikiri Sainik school is the third Sainik school in Andhra Pradesh. The school is the part of the Defense Ministry and the State Government initiative of providing the military education and making the students aware of the defense forces of India. With the campus of hundreds of acres, this school provides the best-in-class education. The Gopalpara Sainik School is based in the North-Eastern State of Assam. The Gopalpara school is known for providing some top-notch students who became the officials in Indian Army. With the acres of campus, big library and the teachers to teach every topic, the students enjoy the environment. Even though the Bihar state is known as one of the backward states in India, it hosts the Sainik school. The Nalanda Sainik school is aimed at providing better education to the students and groom them to become the best military cadets for the Indian Armed Forces. The Gopal Ganj Sainik School is another military school in the State of Bihar. Just like the one in Nalanda, the School shaped many students and made them successful military personnel. There are many students of the same school working in the Bihar Regiment of the Indian Army. The Chhattisgarh is one of the most neglected states in India. Even though its one of the newest states, it has the Sainik School. Ambikapur Sainik School focuses on education and sports. The school ensures the proper physical and psychological development of the students and create right mindset to serve in the Indian Armed Forces. In the hills of Himalayas, the Sainik School of SujanpurTira is located. In the state of Himachal Pradesh, the SujanpurTira Sainik school ensures the students get proper education and get developed to become the right candidate for entering in the National Defense Academy. Even though the condition in the Jammu and Kashmir is not good, the Sainik school in Nagrota is still running without any problems. The Nagrota Sainik school produces tough candidates, who become the part of National Defense Academy and then save the country from the infiltrators and other threats. The Jharkhand is one of the most backward states in India and still it has the Sainik School. The Sainik School in Tilaiya provides the top-notch education to the students from the backward region. The education, training, environment and everything are loved by the students from nearby state and the villages. The beautiful city in the Backwaters of Kerala hosts another top Military school in India. The Kazhakootam Military school focuses on high-quality education, the intense physical regime,and the strict environment. The same things make the best students who go on and serve the country. The Punglwa Sainik School is another gem in the crown of Seven Sisters. In the Beautiful North-eastern state of the Mizoram, the Punglwa Sainik school shapes the students to serve the Mother India. The cultural crown of India, West Bengal hosts the Purulia Sainik School, which is one of the oldest schools in India. The Purulia Sainik School was founded in 1962 with the sole aim of providing better education and grooming the potential army personnel. Amongst all of the Sainik Schools we’ve listened in this post, the Kittur Rani Channama Sainik School is only for the girls. The girls only high school provides the top-notch education focused on the girls and shaped them to become the fierce lady officers in the Indian Armed Forces. This school is only for girls and located in the Belgaum city of Karnataka State. This is the last one in the North-eastern state of the Mizoram. The Mizoram is the northeasternmost state in India and hosts the Sainik school, which is administered by the Indian Armed Forces and the State government. Although not famous as other schools in India, the school still produces some gems. The Haryana State is fortunate enough to have the Military school. Being near to the Indian Capital, the Rewari Sainik School is conveniently located near the Armed Forces headquarters. The Rewari Sainik school provides the high-quality education combined with strict physical training and preparing the students for easy entrance in the NDA. The biggest state in India hosts one of the biggest Military schools. The Lucknow military school is one of the oldest and the biggest Sainik schools with the proven track record. This school was started in 1960 and considered as one of the oldest schools in India for Military training. The Kunjpara Sainik School is one of the first five military schools started as the experiment by the Sainik School Society. The school was founded in 1961 by the Then-Defense Minister VK Krishna Menon for training and recruiting the potential Armed Forces personnel. The Sainik school doesn’t have the open admission concept. These schools follow the Entrance Test model to admit new students. The Admission Test is based on the General Knowledge, Mathematics, Language and the Intelligence. These subjects are applicable for the admission in VI Standard. For the admission in Class IX, the students have to pass the state with subjects like Math, Intelligence, English, General Science,and Social Studies. The Sainik School Entrance Exam is conducted in the January month of every year and applicable for every Sainik school in India. The students appearing in this exam can get admission in the Kittur Rani Channama Residential Sainik School for Girls also. Entering in the these schools is an honor for every student in India. There are many students of the Military school who’ve become the part of Indian Armed Forces and made their name. Not just the Military, but the students who graduate from this school are now successful in other fields like Medical, Engineering,and others. I hope you learned a a lot with this list of Sainik Schools in India. If you have any doubts or want to share some additional information with us, please comment below. When Kapil Sibbal published his zero loss theory, I thought this was inspired by Antoine Lavoisier’s discovery of the Law of Conservation of mass. As per Kapil Sibbal’s law the money is constant, be it in Raja’s pocket or withe the Government of India. The total loss is zero, nothing wrong with it. Now a new twist was added by Mr Chidambaram to the law. I think the new theory is inspired by the theory of relativity, it says the loss also depends on the current state of the matter. In his logic the loss is zero until minerals are mined. Irrespective of the fact that 148 coal mine do not belong to the Government Of India any more. The right of those mines belongs to 148 private owners which were given in throw way price. If you apply the same logic you can sell out all of your gold reserve in a throw away price, it will be zero loss unless you make ornaments out of it. Similarly you can sell out all of your food productions in throw away price but still it would remain zero loss, unless those are cooked. Most importantly you can put all of your black money in Swiss Bank. It will still be a zero loss to the Nation unless those are used. And this is the most important logic the UPA most frequently applies. INDIA DARPAN means Mirror of The Great India. And mirror always shows truth. So get ready for the TRUTH of INDIA.